For decades, India was seen as being on the right side of history. Under the incumbent government, our track record has changed dramatically. For nearly a whole month now, the government of India has been very concerned about the human rights situation in Pakistan. Pakistan’s record on human rights is deeply worrying without a doubt. The attacks on freedom of speech and journalists, the unlawful blasphemy law, the ill-treatment of Balochs, the inability of the government to protect civilians from Islamic extremist violence, the list is long. India is right to call out human rights abuses anywhere, particularly in our neighbourhood. On February 18, 2019, almost all major Indian news channels were running prime time live coverage of ex-solicitor general of India Harish Salve at the International Court of Justice challenging the death sentence of Kulbhushan Jadhav by a Pakistani military court on charges of espionage. It made me proud to see our government making a powerful case to uphold international human rights standards. But as Salve was admonishing Pakistan for its shoddy human rights record, 12 Kashmiri students were assaulted in Dehradun by Hindu extremist groups calling all Kashmiris as ‘traitors’. In the days and weeks that followed, Kashmiri civilians have been under attack on a regular basis in so many parts of India, including most recently in Lucknow. I have never heard the words human rights and Geneva Convention being mentioned so regularly on mainstream Indian TV glibly as I have heard since Pulwama/Balakot. So many of our hyper-nationalistic and bloodthirsty anchors and panelists turned into human rights defenders overnight. Throwing stones from within a glasshouse is never a clever strategy. It is common knowledge in the international arena that India has a dismal track record in human rights. The last five years under the “Hindu nationalist” regime has seen an unprecedented increase in human rights violations. Officially reported atrocities on Dalits has increased eight fold in the last five years, compared to the preceding five years. The vast majority of the nearly 200,000 reported crimes are extreme in nature – murders, rapes and the like. 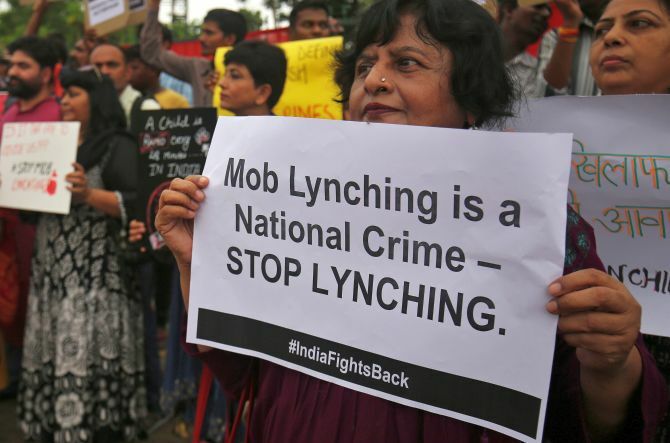 Beef-related lynchings, which led to over 25 deaths in the last four years, shocked the world. The minister of state for home affairs himself disclosed that in 2017 alone there were 822 communal “incidents” resulting in 111 deaths. There has been an alarming number of attacks and even murders of journalists, the most visible one being the tragic killing of Gauri Lankesh in September 2017. The campaign to silence, buy or coopt the media, particularly electronic media, by the current regime has been quite comprehensive and successful. We can now almost count the independent journalists left in mainstream media. Any voice of dissent is immediately crushed or tarnished as anti-national. Arrests of human rights defenders has been relentless. Lingraj Azad, the tribal leader from Nyamgiri in Orissa fighting against the corporate giant Vedanta, is the latest victim. Intimidation and harassment of independent non-profit organisations, particularly advocacy groups that speak truth to power, has led to shutting down of many important institutions. The ministry of home affairs and its agencies are used on a full time basis to go after organisations that are considered unhelpful to the regime’s agenda. Fake encounters reached an all-time high in the last few years, with the UP chief minister Yogi Adityanath alone breaking all records; within nine months of taking power, 1,038 encounters were carried out in Uttar Pradesh resulting in 32 deaths. What is appalling is the level of impunity that powerful leaders and corporates enjoy. In the most sensitive cases, witnesses regularly turn hostile or go mysteriously missing. All of this is on top of the on-going reality of a criminal justice system that has almost half a million people languishing in our prisons for years, sometimes decades, for petty crimes, stuck there because they cannot afford bail, despite a Supreme Court order to the contrary. Most of these people are poor Dalits, Muslims and backward castes as one would expect. Violations of women’s rights abound and even this is increasingly being justified in the name of religion, like the entry of women into Sabarimala temple. When India got its political independence in 1947, Dr. B.R. Ambedkar guided us to adopt a constitution that was a visionary social contract focussed on leaving no one behind. Hansa Mehta, an Indian feminist who was also prominent among the drafters of our constitution, played a defining role in the making women an equal stakeholder in the Universal Declaration of Human Rights. Hansa Mehta went on to become the vice president of the UN Human Rights Commission in1950. For decades, India was seen as being on the right side of history, supporting the struggle for justice in Palestine, South Africa and other post-colonial countries. Fast forward to the last five years and two successive UN human rights chiefs have called out India’s human rights abuses in the last two years. I don’t recall this happening in the history of independent India. When Prince Zeid bin Ra’ad Zeid chided India for serious human rights violations in Kashmir in June 2018, the Indian establishment was livid and dismissed it as the baseless and illegitimate rant of an outgoing “Muslim” UN High Commissioner for Human Rights. But on March 6, 2019, High Commissioner Michelle Bachelet, the soft spoken ex-President of Chile, while presenting her annual report to the UN Human Rights Council, warned India about the growing reports she has been receiving of attacks on minorities, Dalits and adivasis. She also took the unusual step of expressing concern that this divisiveness was being fomented to meet political ends. I am left wondering what Hansa Mehta would have had to say on our country’s current human rights crisis to two of her fellow Gujaratis who have seemingly been running India for the last five years. Salil Shetty is Former Secretary General, Amnesty International. Currently, he is a Senior Fellow, Harvard Kennedy School, Carr Center for Human Rights Policy.